My mother often said simple is best, whether it be simple food, simple style, or simple make-up. She always said, less was more and it was easier to add than take away. This couldn’t be more true, and it’s fascinating how this pertains to all areas of life, whether it be food or make-up. More often than not I find a simple dinner consisting of a sandwich and a side salad can be so wonderful and filling. Summer nights can be hectic, and with that comes little time to prepare meals. After a long day at the beach I often find myself wondering what to cook for dinner, and instead of ordering take-out or going out I make this simple flank steak with chimichurri sauce sandwich. For some reason I call this sandwich the Cisco Sandwich, and I think that’s because after all the beach days I’ve spent at Cisco the name sort of stuck. After a sundrenched day at the beach and a pit stop at Cisco Brewery, I make a quick trip to Bartlett’s where I’ll pick up some fresh produce and meat for this simple and quick dinner. White bread, although delicious is kind of “boring”. I much rather have a delicious herb bread, and when I’m on Nantucket Island the obvious choice is Herbed Portuguese bread from Something Natural. 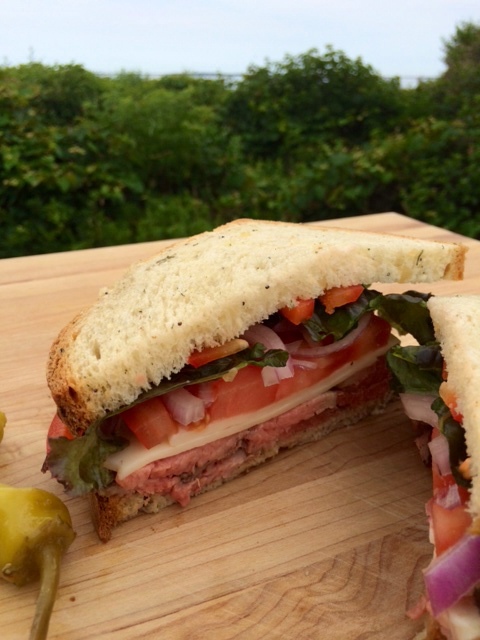 Top this full flavored bread with grilled flank steak, lettuce, red onion, and tomato. 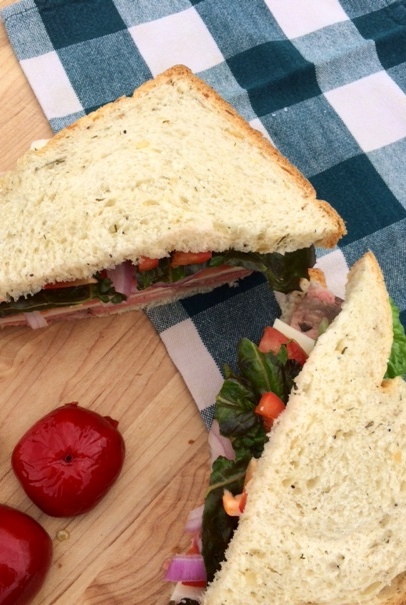 To give this sandwich even more flavor add chimichurri sauce, which makes this sandwich dinner worthy. This is one of those dishes that can be thrown together in under a half hour, but yet looks like it took a lot of effort. 1. 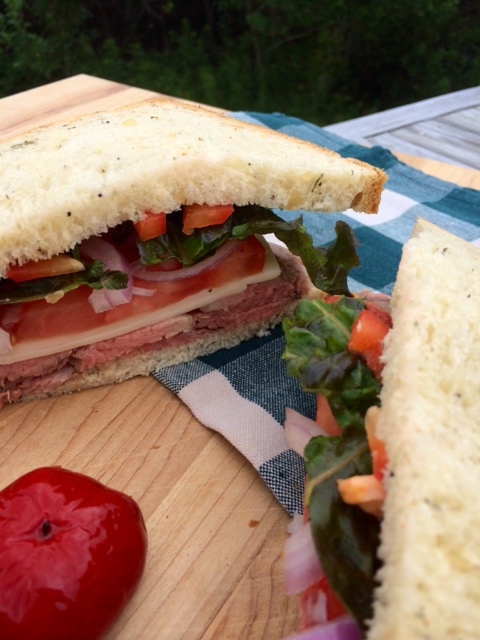 Lay out bread and place grilled flank steak, lettuce, tomato, red onion and cheese on one slice of bread. 2. Prepare chimichurri sauce and spread evenly on the other slice of bread. Place piece of bread on top of rest of sandwich and cut in half to serve. Pulse the garlic, shallots, parsley, oregano, salt, and red pepper in a food processor until roughly chopped. Add the oil, vinegar, and water and pulse to make a textured sauce. Transfer to a serving bowl. Cook’s Note: Make sure to pluck the oregano leaves off the stems–hard stems make the sauce a little too textured. Toss the herb stems onto the fire to flavor whatever you are grilling.